Spending time with Guy Hills is like being in the company of Caractacus Potts. As soon as we meet, he hands me a device he’s been tinkering with, a radio he’s making for his son. It’s the first warm day of the year and Guy is wearing a light-weight cream-striped suit with a casual jumper underneath. He looks as if he’s been disturbed midway through a pleasant picnic. I’m here to talk about Dashing Tweeds, the company Guy set up with Lewis-born Kirsty McDougal, formerly head of Woven Textiles at the Royal College of Art. 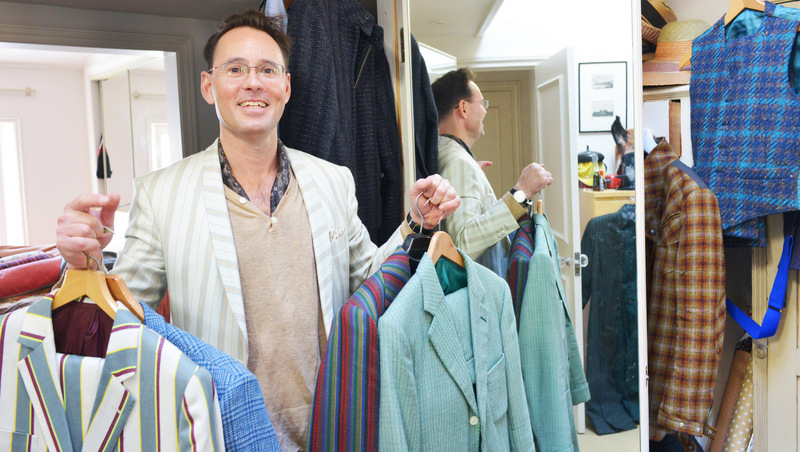 They started the company in Dalston and now have a shop in Sackville Street, off Savile Row, which produces two seasonal fabric collections a year alongside their ready-to-wear and made-to-measure lines. Guy grew up in Marylebone and began work as a fashion photographer with a studio in Camden. 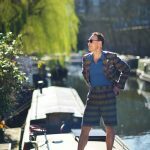 He was asked to be the image maker for the Savile Row Bespoke Association in 2008, which led him to want to bring more interesting cloth and colour to menswear. We go upstairs to look at tweed. The walls in the stairwell are covered in photos that his family send out at Christmas. Guy, his wife Natasha and their three children, Amelia, Hector and Rex, are posed as birds in a tree, spring out of boxes like jack-in-the-boxes, have strings around their arms like puppets, are Hansel and Gretel in a Norfolk wood, or have light-packs under their clothes, making them glow like fairy lights. It’s all rather enchanting. Guy brings out suits from his closet. One is made from a flock of sheep on Romney Marsh and another is the famous Glen Urquhart check worn by James Bond reinvented to give a new weave design. He has tweeds inspired by Bauhaus and others reminiscent of Missoni with waves of different coloured wools. Tweed has always invoked foggy walks through peat fields, but Dashing Tweeds are different: purples, blues, greens and reds burst out from the fabric, and the textures are different too. They work with the highest quality yarns and use wool as a base, but weave in linen, Japanese cotton and innovative fabrics such as rubber and lurex. All the tweed is woven in the Scottish borders, and there are now eighty tailors around the world who use the cloth. Dashing Tweeds work closely with Savile Row cutters and tailors, and have developed a classic English-style silhouette which has structured shoulders, high-cut arms for ease of movement and elegant waist shaping. They occasionally use quirky designs such as box pleats in jackets and cycling trousers with a twisted seam. What drew them to tweed is that it’s traditionally a sportswear fabric, due to it being so practical and durable. As we chat, Guy does a strange thing. He passes me his phone and asks me to photograph a suit he’s holding. Puzzled, I do as requested. The screen flares up in a blaze of stripes! The suit has high-visibility threads woven into the wool which light up when the flash is fired. This is a garment intended to be beautifully stylish, yet practical for today’s cyclists, or a night on the town. I take more photos of reflective suits, each with a different weave. They’re ingenious. Developing the creativity and innovation further, Guy shows me a jacket with purple lights down the back and another one with a red and black reflective panel. Guy doesn’t own any black suits, and if he has to wear ‘black tie’, he wears a purple suit with a bow tie. I can’t help but notice the shoes Guy is wearing. They’re tweed Converse. Apparently Converse read about them and flew over to Dalston. This formed the beginning of their collaboration, and 30,000 pairs were made up in tweed. Other companies have followed suit – if you’ll forgive the pun – and Dashing Tweeds have formed collaborations with Hudson shoes, Fred Perry and Pharrell Williams’ clothing brand, Billionaire Boys Club. They’ve exhibited in the V&A’s Fashion V Sport, at Unica, a textile fair in Milan and at the Ningbo International Fashion Week in China. And Emily Blunt wore their tweed during the filming of Mary Poppins. 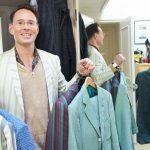 Another wardrobe contains a collection of 1940s suits and a grey, patterned Spitalfields silk waistcoat, made by Huguenot silk weavers. I’m shown a sailor suit made from Ian Mankin fabric. Guy went to the shop on Regent’s Park Road to request some cloth for a suit but was told, “Sir, this cloth is for furnishings.” He made it anyway. Other home-made garments include a giant green dragon outfit, a 20 ft caterpillar suit and a long white woollen coat covered in black pom-poms. It’s time to go downstairs. On our way, Guy talks of his understandable horror of moths. We have a quick tour of the living area. The floorboards are salvaged wood supplied by his brother who formed the company Retrouvius. In the centre of the kitchen is a reclaimed Victorian cabinet with a worktop on the surface and a dishwasher encased at one end. The shelves of the cabinet are lined with old snuff boxes, which his grandmother used to collect. Like his suits, the furniture is a mixture of heritage and modern. Every morning Guy drinks coffee from an ornate silver coffee pot. He loves the design which ensures that the coffee grounds don’t reach the spout but remain at the bottom of the pot. He explains how some ideas just work well, but in many ways we’ve gone backwards. Design is a fine line between being stuck in the past and moving on. He doesn’t much like nostalgia; it colours people’s ideas. We go into the garden to take photos. At the edge of the lawn is a round wooden sauna, and Guy has rigged up another Caractacus Potts structure with a copper pipe so that he can emerge from the steam and have a cold blast of water. 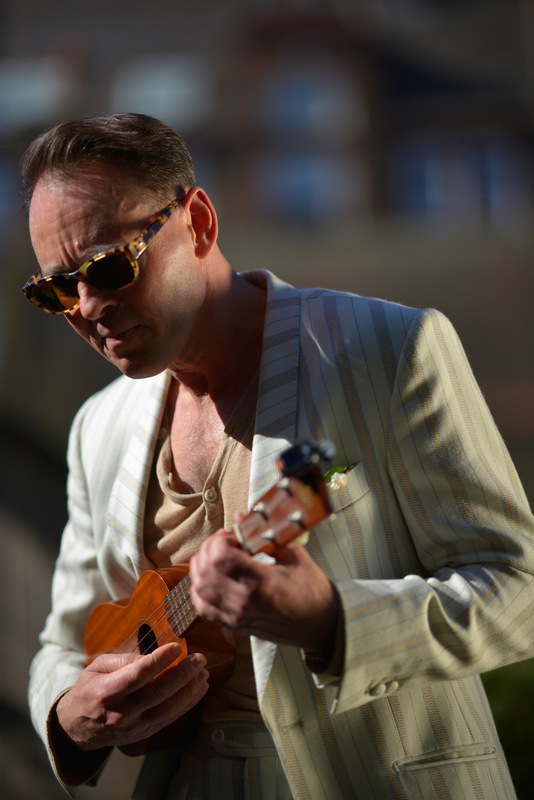 In a pause between shots, Guy picks up and strums a ukulele. It sounds as if someone has just wound up an old 78 rpm record player. 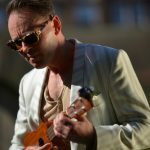 He loves to throw parties, and has a summer playlist of songs ranging between Queen, the Bee Gees, Al Green, the Kinks, Leonard Cohen and the whole of the Ziggy Stardust album. We are treated to a few chords of Starman. Guy’s motto is that we shouldn’t let lack of talent get in the way of being creative. Just have a go anyway. Learning should be continuous. Children learn so much and then suddenly stop. Our photographer Sarah wants to take photos on their canal boat, so Guy dashes upstairs to change quickly. He reappears wearing a tweed shorts suit with matching Converse plimsolls. He plucks a snowdrop from the garden, attaches it to his buttonhole, and we wander down to the boat in a Wind in the Willows style procession. Down at the canal is moored Lilliput, the boat which Natasha had built in Chesterfield to fit the width of the garden. Once on the boat, Guy begins to wipe down the surfaces, “so that it looks as if I do something other than stand about in tweed all the time”. He makes a striking image, and passers-by on the opposite side of the towpath also take photographs. By mid-afternoon, we disperse to pick up children from school and rendezvous in Regent’s Park. Guy arrives on his four-seater bike, which is a familiar sight around Primrose Hill. 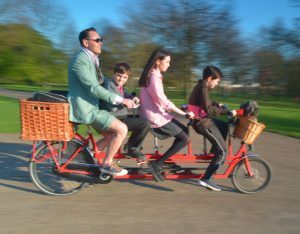 At first he used a bike with two child seats, but when Rex was born he had the four-seater made in Amsterdam and has done the school run with it for years. They circle around the park, creating the perfect advertisement for Dashing Tweeds: Guy and his three children cycling and George the dog sitting in the basket. Previous Previous post: Behind the stalls: A day in the life of Primrose Hill Market.